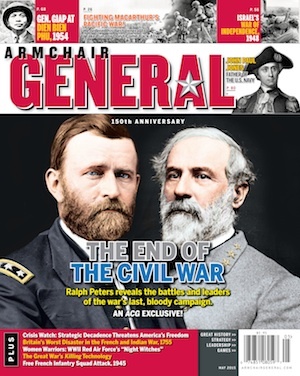 Military History | Armchair General Magazine - We Put YOU in Command! Home » Posts Tagged "Military History"
Napoleon faced many enemies; Wellington learned to fight one enemy well. Colonel (RET) Jerry D. Morelock, Ph.D., examines the strategies and tactics that comprised what we call Napoleonic warfare, including French cavalry vs. British squares. 'Order in Chaos: The Memoirs of General of Panzer Troops Hermann Balck' is the first English language edition of the memoirs of Germany’s best panzer division commander in World War II. From a tank with wings to a tank with no sides, top or bottom, here's a link to 15 things you may not have known about WWII tanks. Memorial Day in the United States officially began as Decoration Day following the Civil War. A short history of the Memorial Day observance.